On Thurs. Nov. 5, an inaugural celebration will welcome Leslie Bellavance as the thirteenth president of Kendall College of Art and Design of Ferris State University (KCAD). It is also day 100ish for president Bellavance on the job, and Rapid Growth's Tommy Allen checks in with her. On Thursday Nov. 5, an inaugural celebration at Fountain Street Church will welcome Leslie Bellavance as the thirteenth president of Kendall College of Art and Design of Ferris State University (KCAD). 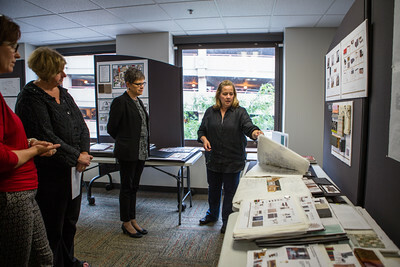 In addition to celebrating the installation of KCAD’s second female President*, the downtown Grand Rapids college will honor a series of other firsts, from a ribbon cutting at the newly redesigned 3rd floor at 17 Fountain NW, revealing KCAD’s Medical Illustration and Illustration space, as well as the college’s new Master of Architecture (MArch) program. It’s also the opening of President Bellavance’s art retrospective at The Fed Gallery at KCAD. With so many firsts happening on one day, G-Sync felt it was time to sit down to learn a bit more about this very exciting moment at KCAD. 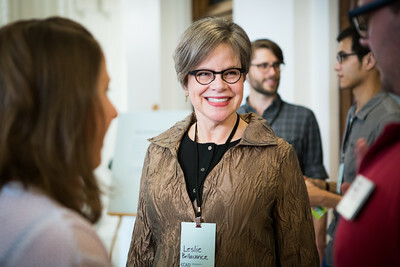 Tommy Allen: Once the evening news rolls their story on KCAD’s events on Thursday, many will be asking, “Who is Leslie Bellavance?” What many not know right away - but will soon enough - is that you are so much more than just a president; you’re also a working artist and educator. So how does one even begin to define you? Leslie Bellavance: These different personas, I guess, that you referring -- that I’m an artist, I’m a teacher, I’m a president -- I don’t, in my day-to-day world, compartmentalize myself that much. I started teaching, very early in my career, and I’ve always felt that teaching and making art go hand in hand. Teaching really puts you into a position of having to understand the field, in the broadest sense. TA: So the proximity of all three in your life’s mission has resulted in this life with a distinct path rooted in the benefits of a life spent in exploration? Courtesy KCADLB: I think that’s a benefit to anyone who’s making art, that one has a full sense of what the sort of world of art-making is. And I think that teaching, also, puts one close with students who are in a position to be exploring new things. Their explorations take them places that you might not think of going yourself. Something that’s not what you’re doing. It influences and keeps you current. So, I think that, for me, I don’t really separate the fact that I’m an artist from my role as a scholar and a teacher. They are all connected. TA: It is hard to argue with your beautiful synthesis as we observe the retrospective of your art at The Fed Galleries. How did your art practice influence the steps leading you to KCAD? LB: I’ve always viewed my artwork as experimental -- an act encouraged academically from an instructor standpoint. The website goes back 20 years and presents a curated view of my work, but it is not all that I have done. Items I was not able to include on the site are the collaborations, installation works, which are interventions with 3-D items like altered books and texts. TA: You appear to flow back and forth between analog and digital quite easily. LB: I think that’s the experimental nature of my work. Throughout my trajectory as an artist, (this has) meant that I have remained very open to learning, to being an early adopter, in this case, of digital media. In fact, I was teaching digital media and photography in the 1990s, going on to create digital programs at three different institutions before I even exhibited my own digital work in 1997. So, I worked in digital for 10 years before I ever exhibited my own work. TA: And with time you’ve added other titles best filed under administration rather than teaching. Why the leap? LB: At a certain point in my life, I realized I had benefitted by a lot of folks who had been in leadership positions. At the beginning, it seemed relatively mysterious to me. And yet, I would witness these interesting situations that leaders would resolve . . . it just seemed amazing to me that someone would have a mind that could design a solution to the problems they were facing. And what I didn’t realize at the time is that what I do in the studio every day -- because my work is experimental, because I dare to ask questions that I don’t know the answers to -- it’s very similar to what people are doing in leadership positions. TA: This seamless guiding-teaching-creating philosophy produced what in you as a result of this thinking? Courtesy KCADLB: First it is a very conscious decision on my part to step into this arena of leadership. I explored it for some time, and I then concluded, “Yes, I want to try this. I think I have something to bring to it, and I’d really like to give back.” So, I do see leadership as service-oriented. TA: How did you come to Grand Rapids as the place you should apply? Was the whole discovery of our city and position at KCAD a brand new experience for you? LB: No, I had known about KCAD for some time before I even applied. Many years ago, shortly after I’d finished my MFA at the University of Chicago and already started teaching in Milwaukee, I was invited to serve as a painting instructor at Oxbow in Saugatuck. After being there for a couple of summers as an instructor, I began to meet other professors at Kendall, including David Greenwood. So I first became familiar with Kendall and Grand Rapids via their educators. TA: A lot has changed since those earlier days, so what moved you to apply? LB: I think the thing that was profoundly intriguing to me was the development of Kendall since the merger with Ferris State University. Also, I think that the mission of Ferris State University, as a public university, and Kendall’s mission, in its transformation to be part of Ferris, has been this public mission of providing accessible education, an education that speaks to careers, that has an interest in what students do once they graduate. They have a mission to provide an education that’s affordable, an interest in offering quality education while keeping an eye on debt that students may have at the end of their education. They want to be a part of their career process after, too. TA: You have been here just over 100 days. What makes us stand out? LB: First, I have witnessed maybe a half-dozen art and design schools merge so I am aware of the challenges facing education. But what I like here is the attention to detail that FSU has played and their desire over the years since the merger to maintain an identity tied to city of Grand Rapids. TA: It is wonderful to see so many art students roaming the streets. Their energy is wonderful and each year the growth is visibly noticeable beyond just KCAD’s students and buildings. LB: Grand Rapids has this mysterious thing -- from afar, I could sense it. But now that I’m here, I can really see it, and it is this incredible community, as a city, and how they attend to one another. They are collaborative and supportive of one another. When I visited in the hiring process, I spoke to faculty and students and the one thing that was most clearly articulated was their interest in continuing and expanding these community partnerships. TA: I know that is something I was hoping we would not lose after David Rosen departed. Courtesy KCADLB: The collaborations that KCAD has in our community are real and tangible. From the newly opened Grand Rapids Public Schools’ museum school to our medical illustration program in collaboration with Michigan State University to our partnership in industrial design with Grand Valley State University, these are all great examples of what we mean when we talk about collaboration. TA: How will we keep the collaborative magic going under President Bellavance? LB: Well, we are in the process of creating a new strategic plan that is set to wrap up in 2016. But I am also an advocate for the arts and design. And so, I do try to take the broader view on these topics of art and design, art education, art history, and other related fields, because I think that we all need to serve as advocates, these days, of those fields. TA: And will society’s view change as a result? LB: Even though I feel society is embracing them in a new way, I think greater understanding and connections will happen through greater advocacy on our part. Just as we do in art and design . . . we (at KCAD) are a critique culture. I would like to open up more conversations within the community. For the best entertainment options with a twist that the Greater Grand Rapids region has to offer, please visit G-Sync Events: Let's Do This! *Correction: Rapid Growth reported earlier that Leslie Bellavance was the first female president of KCAD. Bellavance is the second female president. 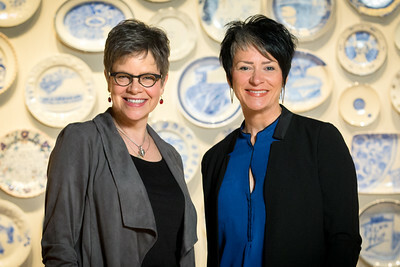 The first honor belong to KCAD president Dr. Phyllis I. Danielson (1976 – 1989).